This last Saturday, we were lucky enough to have Sue, a representative from Progressive stop by and feature some of their awesome products. 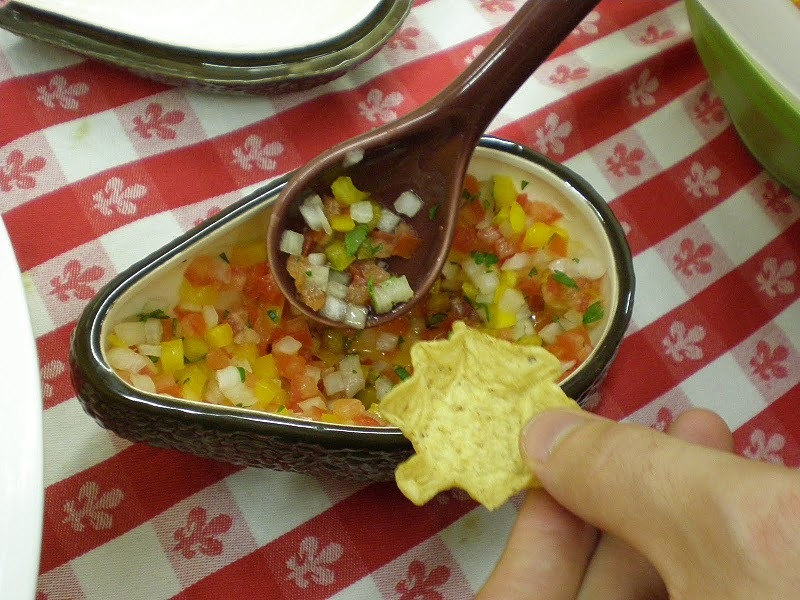 She not only showed off some of their newest and neatest, but she made a delicious and easy salsa. Sue, getting ready to salsa! The star of the demo, the Onion Chopper, went to work first. 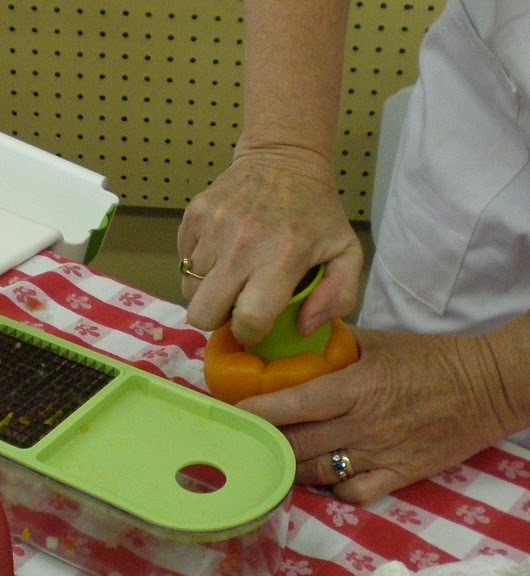 It’s not just for tearless onion chopping, but also works on tomatoes and colorful bell peppers deftly cored by the Pepper Corer Duo. Both items do the work of a knife in a fraction of the time. To preserve those with less daring palates, we refrained from adding powerful chiles. For those who crave more heat, the sidekick of the Pepper Corer Duo is made for the narrow cores of chiles. Ingredients, and the handy new board! Progressive’s Fresh Herb Keeper and Fresh Herb Pro are ideal for storing and prepping fresh herbs. The herb keeper keeps fresh herbs green and hydrated on the counter or in the fridge. The Fresh Herb Pro is one of our favorite items, with handles that sport ridges to catch and trim herb-y leaflets from twiggy stems. Collect all the leaves in the cup and shear them to bits in seconds with the spring-action scissors. Fresh cilantro is a must for salsa and the Collapsible Salad Spinner is clutch for washing and straining the herb. 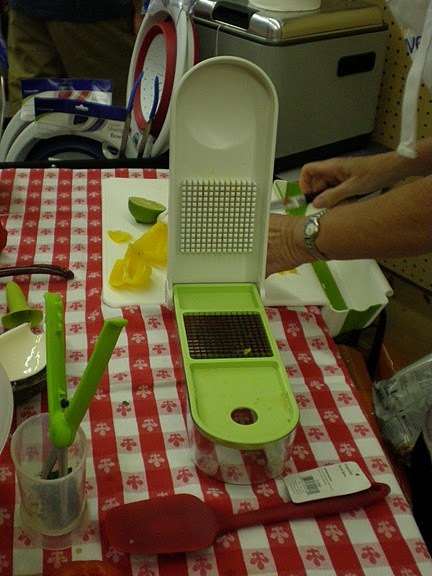 For tang, we added fresh-squeezed lime juice using the Lime Squeezer. Nothing fancy with this item, just sturdy cast aluminum construction. Another item we love is the Collapsible Bin & Board, shown above. This poly board is 15-inches wide, providing the optimal amount of work space. It hugs the corner of the table between its lip and its no-skid feet. The neatest part is the attached bin. 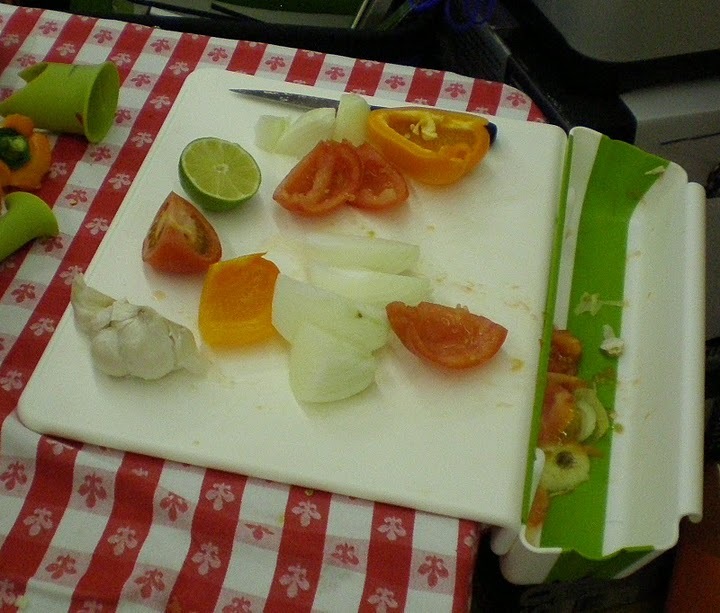 Vegetable scraps go right in with a sweep of your knife and the board is ready for more. The bin detaches so you can easily enrich your compost with the day’s leavings. For serving, they featured the avocado-shaped Guacamole Bowl and the chile-shaped Salsa Bowl. Each is lidded and comes with a serving spoon that fits in the bowl while the lid is on. For the colors of our salsa, livened by sweet bell peppers, the deep avocado green of the Guacamole Bowl made a pleasing contrast. See how it all came together, in the video below! 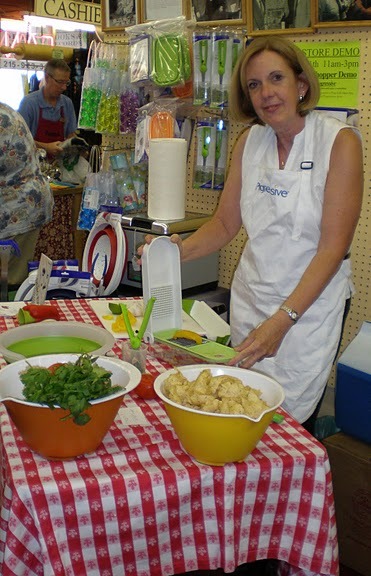 Many thanks to Sue from Progressive for demonstrating these products with delicious results.